"You can't take me away from boat people. There isn't one of them wouldn't die for me, or one I wouldn't die for." 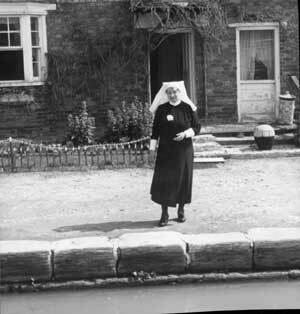 Sister Mary Ward was born in 1885 and was the daughter of Thomas Amos the rope and twine manufacturer of Stoke Bruerne. She was never professionally qualified as a nurse but she spent ten years nursing in convents in Europe and travelled widely between England and the USA before she returned home to the large Georgian brick house to nurse her sick father. This brought her into contact with the boat families again, many of whom she had known when she was growing up in Stoke bruerne. She married a Charlie Ward and as her father's health declinrd, Charlie took over the runing of the shop and her father's rope business. 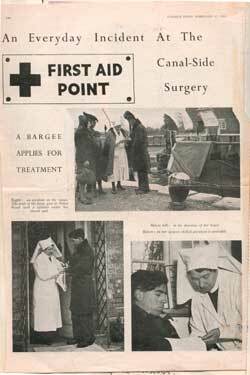 It was when Charlie moved his business to a shed by the side of Lock15 (formerly occupied by the stonemason), that the shop became Sister Mary's surgery and she continued to administer medicine and care to the boat people. 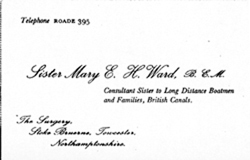 This was in an unofficial capacity at first and she financed it from her own pocket until the late 1930's when the canal company realised the benefitial work she caried out and appointed her 'Consultant Sister to long distance boatmen and families , British Canals'. She carried out many duties, not just for the boat people, but for the village and the local community as well. 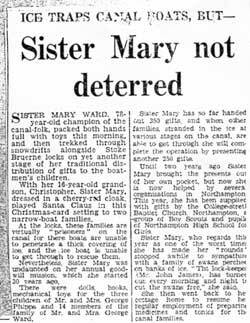 She was the nurse and medical advisor to the school (see the extracts from the school log book on the school's page), she delivered babies, wrote letters for the often illiterate boat families, and even dressed up as Father Christmas to deliver presents to the boat families (as you can see in the newspaper cutting below). "People think my boat people are dirty and crude and want to get rid of them, but they are woderful, proud, wise people". Towards the end of her life she was recognised for the hard work she had done and was awarded the B.E.M in the New Years Honours list of 1951. On April 13th 1959 she was the subject of 'This is your life' with Eammon Andrews, many of her friends from Stoke Bruerne attended the screening and a picture of this can still be seen hanging on the wall in the Boat Inn. The Nursing Mirror ran a story about her life and work in May 1947 and even the Times newspaper printed an interview with her on January 8th 1962 (an excerpt of which can be seen below). At the age of 73 British Waterways 'officially' retired her on a tiny pension but she still carried on as the 'darling' of the boat people for another seven years. She eventually went to live with her daughter in London and died on 22nd March 1972 in her 87th year. She was buried in the Baptist churchyard in Roade. 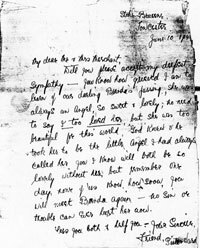 A letter written by Sister Mary to the parents of Brenda Marchant on the sad death of their daughter.